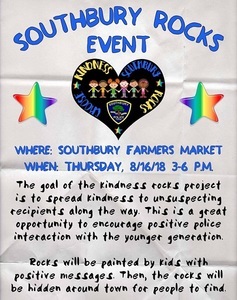 Southbury happenings include spreading kindness with Southbury Rocks! Gatehouse Cafe concert series presents Timmy Maia, a Waterbury native who thrills audiences with his soulful style and smooth R&B vocals. Organizers: Southbury Training School. Save ON College, Not just FOR College. Organizers: The Jones Financial Group/Northwestern Mutual Wealth Management. Library's Calendar contains information about upcoming programs for adults, teens and children.